I heard that on CBS evening news tonight (slightly paraphrased). Last night on CNN, Poppy Sanchez (or whatever her name is) said that encryption was used to hide all of their communications, and that it was very concerning. They are alluding to encryption as a bad thing because the terrorists used it to coordinate their attacks. They may have used automobiles too, but they didn’t seem concerned about that. Why this attention to encryption irks me is because there has been a concerted effort by governments of the world (ours in the forefront) to get major tech companies (Google, Amazon, Facebook, more) to build so-called “backdoors” into encryption technology. That means that if you send an encrypted message to someone, otherwise unreadable by anyone except the person you sent it to, it can still be read through this “backdoor” by the governments who are in cahoots with the tech companies, allegedly to be able to monitor communications amongst the bad guys. You’d think that’s a good idea, right? Well, it’s been proven over and over again that backdoors get found and exploited by people who are not supposed to find them. That is what hackers do, for better or for worse, and it’s usually for the better. You heard me correctly. Hackers find exploits and tell people about them so that they get fixed, and make everyone safer. That is what my day job involves, actually. Sure, there are evil hackers who like to exploit these things for nefarious purposes, but that’s why we continue to find vulnerabilities and fix them. The news outlets are pushing this idea that encryption is some dark arts majik that terrorists are using, while no one else would ever dare need such a thing. I worry that this will give the general public the wrong idea: that encryption = terrorism, so we need to do something about it. What better time to push this idea than after a terrible tragedy? Today, we are seeing government pushback against encryption. Many countries, from States like China and Russia to more democratic governments like the United States and the United Kingdom, are either talking about or implementing policies that limit strong encryption. This is dangerous, because it’s technically impossible, and the attempt will cause incredible damage to the security of the Internet. Edit (9:4pm): I missed the story circulating about this exact topic, confirming everything above. I know at least one of you is eagerly waiting, with baited breath, on the edge of your seat, for the latest goings on of my endeavor into the land of the glutenless. I haven’t posted any updates on this since what…day two? Wow. Sorry about that. I am on day 17 now! The struggle has been real, yo. On day 3, I came down with a nasty cold that laid me out for a few days. Still, I gluten-freed my way through it. However, that was right when Rachael came down with the same thing. Not a good introduction to a potential lifestyle change, but we survived, looking forward to the positive changes to come. I will recap the positives first. We found that Asheville has a lot to offer the gluten-freers of the world. Not only do the grocery stores help out with options and signage (Earth Fare in particular, for most options in one place, Ingles for signage), there are restaurants that have large amounts of GF options on the menu. One in particular, King Daddy’s Chicken and Waffles, even has a separate GF frier. We’ve been back twice to get the hankering for fried food satisfied. After too many trips to the grocery store, we finally found some things that were not too bad, including the Udi’s pizzas, Glutenfreeda burritos, and Glutina crackers. Rachael also came up with some good recipes that we tried. I got into weekend omelette making as well. Hash browns and bacon pulled me through. I am pooping regularly, like a champ (probably because I’ve been eating a lot of pumpkin and sesame seeds as snacks). I have found myself wanting to cave on this effort more than once. The main reasons I got into this were to see if all the benefits I’ve heard about going gluten free would work for me. I was hoping to lose a few pounds, see some improved skin/complexion, feel less fatigued, and most importantly, see a reduction in arthritic symptoms I tend to have in my hands and wrists. Sadly, none of those things have shown any sign of coming to fruition. 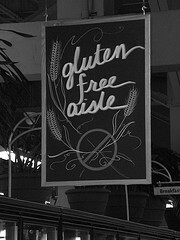 So, I have decided that this blog update will also serve as my official notice that I am going back to gluten! I am definitely more aware of how much gluten I was used to in my life before this effort, but I see no reason to avoid it any longer — with the exception being overly-processed white-bready types of things. Those, I will stay away from as much as possible. It will be my homage to the Great Gluten Deprivation Project of 2015. Let’s go have a beer and a burger!